The next four posts were written in the aftermath of a mass murder tragedy in late 2012. The first post of this “Tetrahedron”: “Choice? Chance? Bashert?” was set to post on the day that event occurred. The post that follows the Tetrahedron, No Victims/No (D)evil was going to be posted the next day. 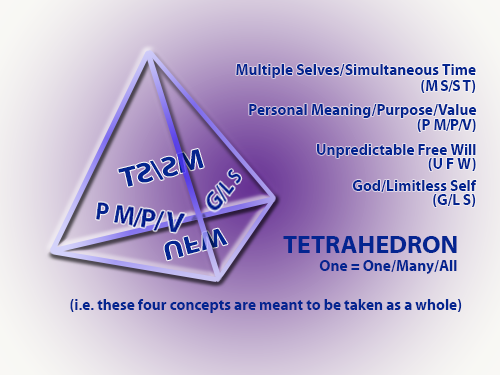 In light of that sensitive moment, and knowing it would be hard to explain the No Victims/No (D)evil post without more context the Tetrahedron was created. During the creation of the Tetrahedron a journey was made to the New England Holocaust Memorial. None of what is written in No Victims/No (D)evil is delivered lightly. Like Buckminster Fuller’s primal 3D shape, created from the theoretical and practical closest packing of four spheres, this is a solid starting place for practically and consciously constructing reality. The Tetrahedron will be helpful for putting into perspective some of the most awful of Earth Experiences. God forbid they happen very often and maybe they will happen less as more is known about how and why we construct our life stories. Each and every life, by nature, has meaning, purpose, value. Each life/being shares its life with many other lives, physically and multidimensionally. Each life/being/self has the attribute of consciousness and unpredictable free will, in the context of the free will of all the other lives sharing its realites, and according to the parameters of its form. After the Tetrahedron I will finish out the Core Material so I can then launch regular posts to, I hope, show that these WhatIf?… theories are inherently practical and useful in fulfilling one’s Earth Experience. There is no separating life/reality/experience/story from God. But there are infinite personal interpretations. IYouWe are making MyYourOur own interpretation right Now.